Stainless steel bars can be finished hot or cold and formed into rounds, squares, hexagons, octagons or flats. These shapes may be used as is, but are more commonly melted down or otherwise reworked by manufacturers into additional shapes such as angles, channels or tubing. Stainless steel bars offer advantages such as corrosion-resistance, high ductility, high weldability and cryogenic toughness. Another benefit of stainless steel bars is that they are totally recyclable, creating increasing demand amongst environmentally-friendly consumers. Bars allow for easy consumption because the volume is straightforwardly regulated and pre-forms make shipping and processing much more predictable. Some of the wide-ranging applications of stainless steel bars include sinks, building materials, metal structures, hospital equipment, gratings and consumer appliances. The shape of the stainless steel bar impacts what application it will be used for as well as how the bar has been processed. For instance, galvanized stainless steel bars are most often used as grating. Typical industries that utilize stainless steel bars include telecommunications, aerospace, construction, masonry, marine, automotive, electronics, medical and petrochemical. Manufacturing stainless steel bars is a multi-step process. First, the raw materials are melted together in an electric furnace for 8 to 12 hours, until they reach their recrystallization temperature. The molten steel is then cast into semi-finished forms called billets, but can also be referred to as bars. If desired, the stainless steel bars can then undergo a forming process via hot rolling, where they are formed into various other parts and shapes. They are then heat treated through annealing, where the steel is heated and then cooled through quenching or air hardening. The steel hardens or softens, depending on the amount of time it is let to cool. When it has cooled, the stainless steel is descaled, which removes any buildup by pickling or electrocleaning. It is then cut to obtain its final desired shape and size by shearing, blanking, nibbling or flame cutting. Further processing to acquire a certain type of finish is done through hot rolling, cold rolling, annealing, descaling or different combinations of these processes. 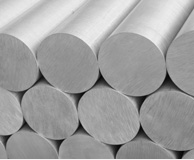 The most common grades used to form stainless steel bars include 304 and 316. The 300 series are types of austenitic stainless steel, meaning that they are useful in mild, harsh and corrosive environments as well as being non-magnetic. 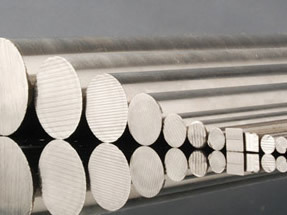 Stainless Steel Bar Stainless steel bars, also referred to as rods, are solid pieces of various grade stainless steels that are rolled from billets.